SIS LIVE: first Ka-band SNG uplink truck for ITV/ITN. 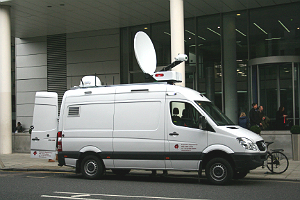 February 2014, Milton Keynes: SIS LIVE is pleased to announce the completion and delivery of the first vehicle as part of its seven-year Ka-Band satellite newsgathering (SNG) contract with ITV and ITN. This highly-specified uplink truck will form part of a fleet of 18 HD vehicles, all due to be delivered in 2014. The new fleet, entirely designed and integrated by SIS LIVE’s in-house project team, is based on Mercedes Sprinter and Vito vans with 1.2m and 1.0m SIS LIVE uplinks. The antennas are the lightest, most flexible vehicle-mounted satellite systems in the world. The reduced weight, compared to competing antennas, allows for a higher spec system to be installed in a smaller 3.5T vehicle, thus avoiding the 56mph speed restriction of the 5T vehicles and allowing the swiftest response to breaking news stories. On board equipment includes HD, SDI, fibre and wireless camera inputs as well as highly-specified vision and audio mixers. Each (ITN) truck is dual-path capable with redundant transmit chains and features a generator with battery-powered UPS backup. An enhanced dual modem system ensures the most efficient and reliable use of bandwidth for IP over satellite. ITV and ITN will be the first to benefit from SIS LIVE’s extended provision of IP services which sees the launch of a new iDirect hub at MediaCityUK to work alongside its existing Milton Keynes iDirect services. This new infrastructure provides greater resilience and additional new functionality. SIS LIVE’s in-house software development experts are working on the upgrade of its proprietary uBook system to enable the dynamic allocation of bandwidth between DVB and IP carriers, ensuring that the satellite capacity usage is maximized at all times. This effectively transforms ITN and ITV’s new SNG fleet into “news bureaus on wheels”, delivering “source to studio” file based content alongside breaking live news. SIS LIVE’s uBook is a fully integrated and secure booking system that works seamlessly with any satellite capacity, enabling broadcasters to effortlessly provide live coverage on-demand with uPod uplinks.